This week we’re very pleased to offer up three short reports by Brian Evenson—running Monday, Wednesday, and Friday. I can still remember my grandmother’s phone number, even though she has been dead for three years and for several years before that had lived first in a home and then with my parents and so no longer had that number. Before that, I called the number at most twice a year, but it was so burnt into my memory that I never had to look it up. 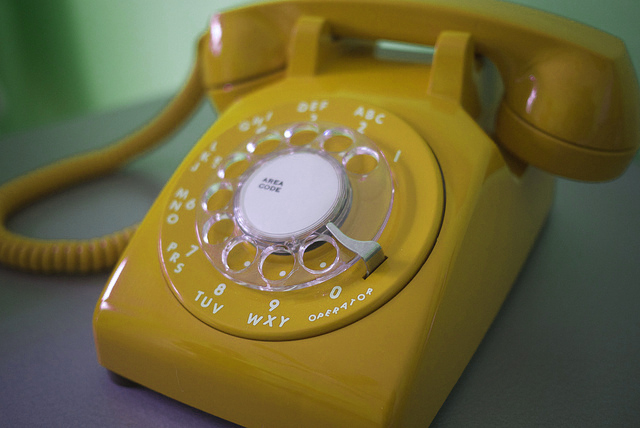 Sometimes, true, I would have to sit for a moment imagining that I was staring at the face of the yellow rotary phone I grew up with and on which I first dialed her number. I am not sure that “face” is the right word for the front of a rotary phone, and am suspicious of that word even when used in regards to clocks, but I don’t know what other word to use. Dial, maybe. Sometimes, I would even begin dialing the number unsure if I knew all the right digits, but by the end the number would have come to me. Even when, later, I was dialing on a touch-tone phone, something in my head was considering the duration of the movement of my finger from a hole in the rotary dial to the metal bar that signaled the end of the rotation and translating it into a numeral, but it was being done in a part of my head I had only a muddled access too. In other words, I twitched my finger pretending I was dialing and suddenly envisioned a number, though I was never sure quite what happened in between. I still remember my own defunct number from when I lived in Denver with C., and then the subsequent number I had when I lived in Denver with J., even though both those numbers are no longer in service. I remember the numbers of ex-friends and the deceased. Even of N., the son of a neighbor down the street from me when I grew up who I was never friends with, more acquaintances really, and who I only called maybe three times. No doubt that number is defunct as well. How much of my mind is occupied with numeric sequences like this, sequences that there is no reason to remember? Now I have a cell phone that preserves the numbers I dial, so that I end up looking not at a number but at a person’s name. I don’t dial a number, I touch a name with my fingertip, which means that there is no longer a need for me to remember telephone numbers. And so, now, I don’t. I know my parents’ number, but they’ve had that number since I was four. What I don’t know are the numbers of their cell phones. I know the number of the parents of the person who I shared a dorm room with when I was a freshman in college, but I don’t know my daughters’ cell numbers, even though I call them weekly. My great memory for numbers is no longer an asset. It is a skill like carving a wheel out of wood, useful only as a novelty, and since I no longer use it, it has begun to atrophy. Or maybe it’s simply that I’m getting older. I would like to know if my losing my ability to remember numbers can be blamed on cell phones or has to be blamed on my getting older. Is there anyone who can tell me that? Brian Evenson is the author of a dozen books of fiction, most recently the story collection Windeye (Coffee House Press 2012) and the novel Immobility (Tor 2012), both of which were finalists for a Shirley Jackson Award. His novel Last Days won the American Library Association’s award for Best Horror Novel of 2009). His novel The Open Curtain (Coffee House Press) was a finalist for an Edgar Award and an International Horror Guild Award. Other books include The Wavering Knife (which won the IHG Award for best story collection), Dark Property, and Altmann’s Tongue. He has translated work by Christian Gailly, Jean Frémon, Claro, Jacques Jouet, Eric Chevillard, Antoine Volodine, Manuela Draeger, David B., and others. He is the recipient of three O. Henry Prizes as well as an NEA fellowship. His work has been translated into French, Italian, Spanish, Japanese and Slovenian. He lives and works in Providence, Rhode Island, where he is Royce Professor of Teaching Excellence in Brown University’s Literary Arts Department.